High above the Earth from aboard the International Space Station, astronaut Ron Garan snapped this image of Hurricane Irene as it passed over the Carribean on Aug. 22, 2011. 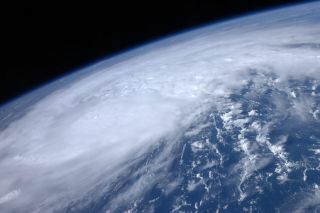 As Hurricane Irene nears the United States, an American astronaut has snapped a stunning view of the powerful storm from space. NASA astronaut Ron Garan photographed the Category 2 hurricane Monday (Aug. 22) while gazing down on Earth from the International Space Station, which he and five other spaceflyers currently call home. Hurricane Irene is the first hurricane to form during the 2011 Atlantic hurricane season, which began on June 1. It is currently a Category 2 type storm on the Saffir-Simpson scale of hurricane strength, with wind speeds of about 100 mph (160 kph). Irene is poised to become a major hurricane today (Aug. 23) or tomorrow. There have been nine named storms this hurricane season (including Irene), but all the previous tempests remained tropical storms (defined as having winds between 39 and 73 mph, or 63 and 118 kph). "The National Hurricane Center noted on Aug. 22 that Irene is expected to produce total rainfall accumulations of 5 to 10 inches across Puerto Rico, The Virgin Islands, the Dominican Republic, Haiti, the Southeastern Bahamas and The Turks and Caicos Islands," NASA officials wrote in a statement. "Isolated maximum amounts of rainfall may reach up to 20 inches." Irene marks a record in the most named storms in the season before the appearance of a hurricane — in all other seasons on record, names did not go past "G" without the formation of a hurricane. Irene is also poised to be the first hurricane to make landfall in the United States since Ike in 2008. The lull since then is the longest since the three-year gap between Hurricane Irene in October 1999 and Hurricane Lili in October 2002. Recently updated forecasts for the 2011 hurricane season call for 16 named storms, nine hurricanes and five major hurricanes (those of Category 3 or higher). So far there have been nine named storms and one hurricane.